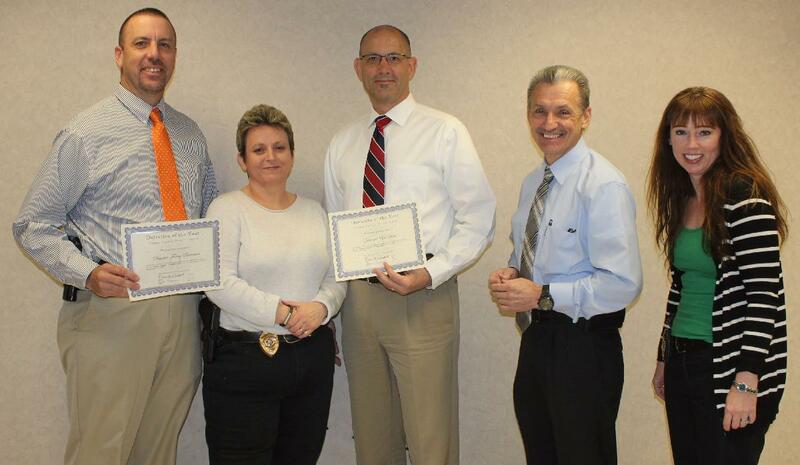 Two Morristown Police Department detectives were recognized for their outstanding performance during 2016 receiving the annual “Detective of the Year” award. Police Chief Roger Overholt, Major Michelle Jones and Detective Captain Christian Newman presented Detective Phil Hurst of the Crimes Against Persons Squad and Detective Tracey Bowman of the Crimes Against Property Squad with a certificate of achievement award for outstanding performance, as the leading investigator on their respective squads. The presentation was held during the March 17, 2017 Investigations Division staff meeting. Detective’s Activity, Extra Activity, Attendance, Open Case File Review, Closed Case File Review, and Peer Votes. Chief Overholt, Major Jones, Detective Captain Newman, and their co-workers congratulated the two Detectives. This is the eighth “Detective of the Year” award for Detective Hurst, who received the award in 2003, 2006, 2008, 2009, 2010, 2012 and 2015. It is the third award for Detective Bowman; receiving the award in 2007 and 2015. Both detectives’ names have been engraved on the “Top Detective” plaque housed in the Investigations Division to honor their achievements.